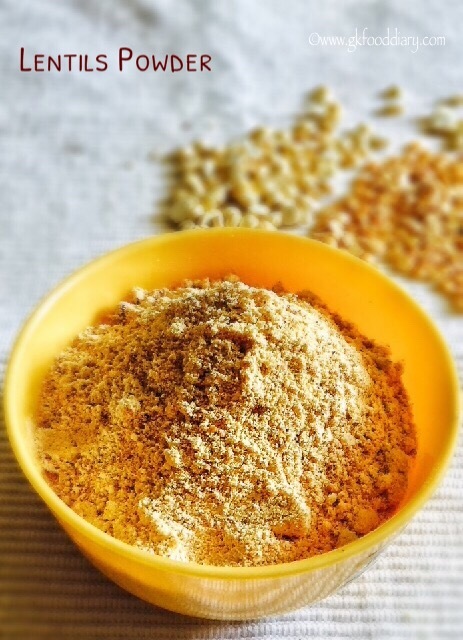 Lentils powder or paruppu podi – mix of lentils, garlic and spices, tastes best when mixed with rice. This lentils powder is so flavorful, tasty and healthy as well. It comes handy and comes to rescue when your child have no mood to eat, tastes divine when mixed with hot rice and ghee. It can be given to kids after one year, once they joined eating with the family. Make sure to adjust the spices according to your child’s tolerance level. 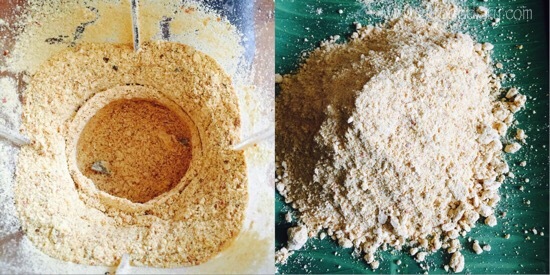 This lentils powder recipe given here is medium spicy with the ingredients mentioned. I am very happy to write this post as a guest post in Shravas Kitchen. 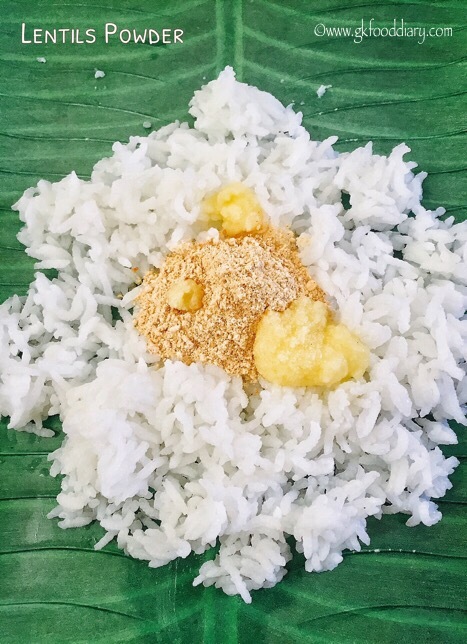 I got to know Swathi through a Facebook group and really impressed by her recipes, I like her as a person too as she is such a sweet personality. She is so motivating and always appreciate others work. When she approached me for a guest post, I couldn’t wait to do it. I have shared this paruppu podi recipe the next day, hope you like it Swathi? 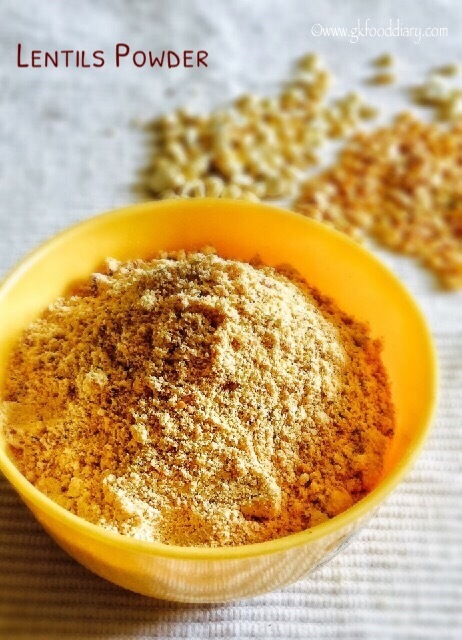 Here is how to make easy and tasty lentils powder or paruppu podi for toddlers and kids. 1. Measure and keep all ingredients ready. Dry roast toor dal in a medium low flame until golden brown. 2. When the toor dal is slightly golden brown, add hing and cumin seeds. Mix well. Remove from the pan and set aside. 3. 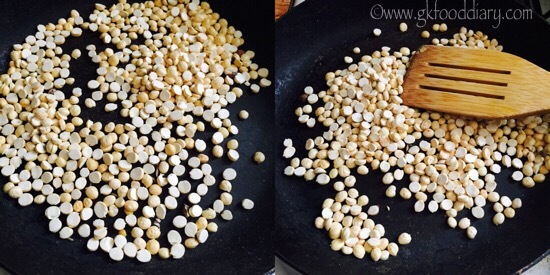 In the same pan, Dry roast fried gram dal in a medium low flame until hot to touch. Remove from the pan and set aside. 4. 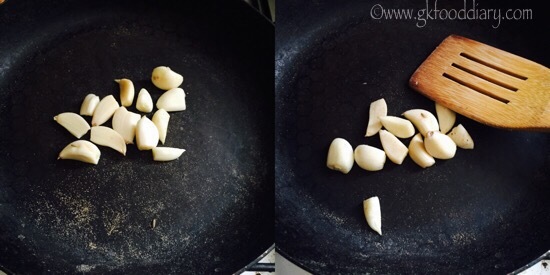 In the same pan, Dry roast garlic cloves in a medium low flame until hot to touch. Remove from the pan and set aside. 5. In the same pan, add 1/2 tsp of oil and fry red chillies for a minute. Remove from the pan once done. Once all the roasted ingredients are cooled down, add everything to a blender along with salt . 6. Blend all together to a fine powder. Transfer the lentils powder to a plate and spread it. Cool it down and store in a air tight container. 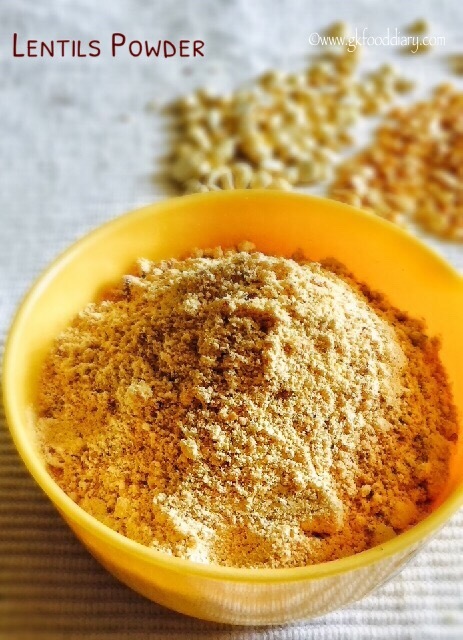 The tasty lentils powder is ready, mix it with hot piping rice and ghee. Tastes yum! 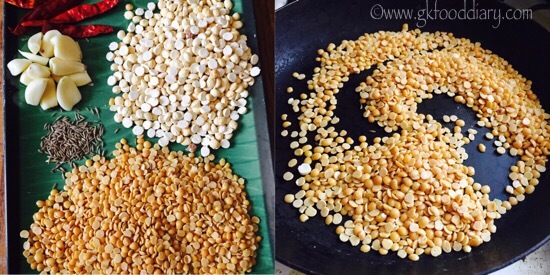 You can use chana dal instead of fried gram dal. 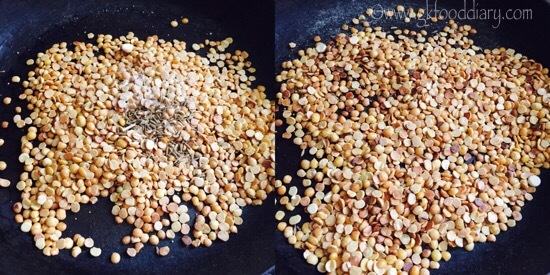 If using chana dal, dry roast it until golden brown. 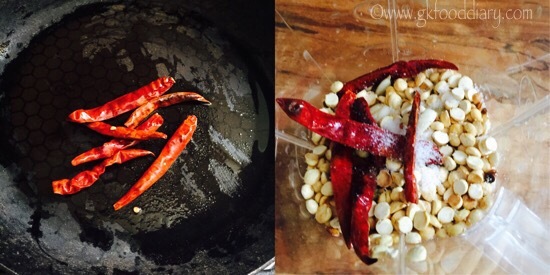 Its medium spicy with the ingredients amount mentioned, adjust red chillies and garlic according to your preference. Make sure to roast the toor dal well at the same keep an eye on the flame to not to burn it. Store the lentils powder in a air tight container and keep at room temperature. It stays well for a month. Make sure to introduce everything separate to your baby before you try this lentils powder. You can try moong dal ladoo and dosa with it..